Today, the My Creative Time team is sharing projects which were made in minutes. Sentiment: You are worth it. 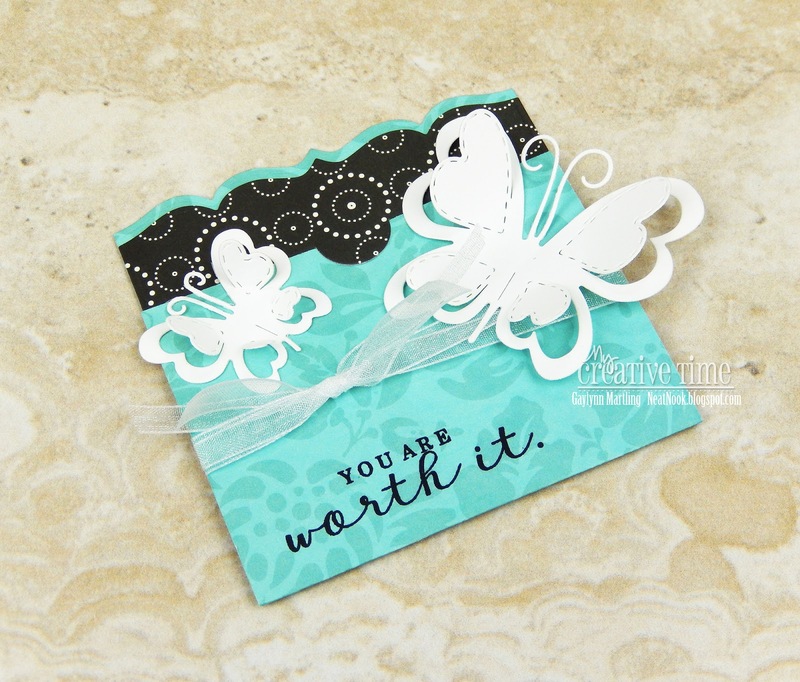 The quick and easy gift card holder was made with die-cuts and one sentiment stamp. The gift card die is one piece. When paired with double-sided paper, it creates a decorated look. I just added butterflies, a sentiment, ribbon and an extra trim piece for the top. Supplies: My Creative Time Amazing Things and Embossed Gift Card Holder Die; Big Shot, K and Company double-sided paper, ribbon and archival ink. OMG Miss Gaylynn What a Gorgeous Gift Card Holder!! WOW You totally came up with Brilliant and Ingenious ideas to achieve your look!! Loving the papers, colors and all the dimension .... You so did a Super Incredible Creative job!! YOU so ROCK! !